The T-shirt of Terror's scary Arabic glyphs were enough to get Miru Kim pulled aside by New York City's finest for a chat. "I just got stopped by two police officers in downtown Manhattan just because I was wearing this shirt from an anti-Iraq war group called Granny Peace Brigade from 2006. They took all my info, my address, apt. number, cellphone, right in front of my building," she wrote on Instagram. "Are they serious, NYPD? 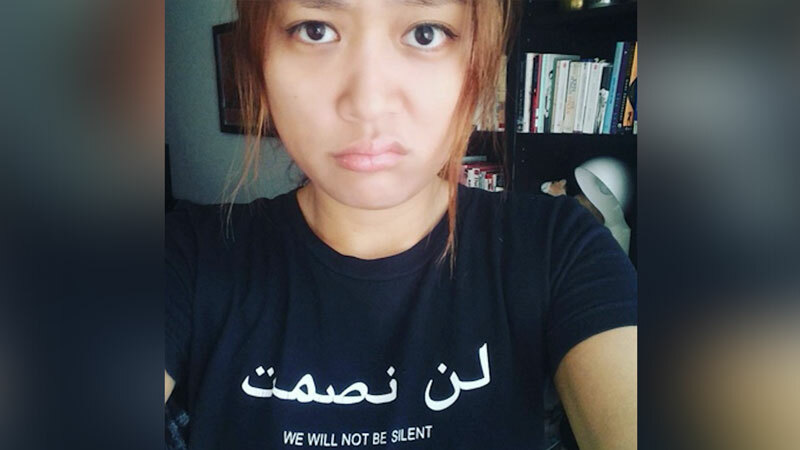 Are they gonna call me a potential terrorist because I am wearing a shirt with Arabic on it?" Interviewed by Gothamist, Kim says she found it a bizarre and "quite intimidating" encounter. "I thought it was kind of annoying getting all of my information taken down by police," Kim said. "I didn't ask why. I didn't really say anything. I basically just complied and explained that it's just a shirt from a long time ago." Raw Story reports that it's not the first time wearers have gotten into trouble. Raed Jarra, an Iraqi immigrant, was detained during [one] incident and eventually won a $240,000 settlement against JetBlue. A Hunter College student was questioned and warned two months after Jarra’s detainment while wearing the same shirt on the Staten Island Ferry.